Why have Presidents from either party failed to protect American interests and why do they advance a globalist agenda that undermines America’s borders, trade interests and foundational principles? The stated purpose of the IDU is to bring about implementation of the Universal Declaration of Human Rights. Article 29, Section 3 of the Universal Declaration states; "Rights and freedoms may in no case be exercised contrary to the purposes and principles of the United Nations." 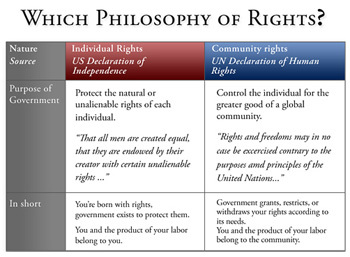 Under the Universal Declaration an individual’s “rights” are what is from time to time granted or rescinded by an elite group of powercrats who work to protect a messy insider ‘consensus’ consortium of economic and political interests. In general, these are people who seek power and control over others – ‘individual liberty and self-governance’ be damned they say. Implementation of the Universal Declaration of Human Rights requires globalized political and economic machinery. This machinery, which includes the IDU, works to cause the surrender of national economic and political sovereignty in order to aid the advent of global governance and its so-called Universal Declaration of Human Rights. Included in the 80 nation/political party membership of the IDU is the GOP and the Conservative Party of Britain. It is time to recognize the Republican Party for what it has become; an instrument of a globalist political system designed to destroy American systems of justice, government, and economics. The IDU is the philosophical companion to the Democrat Party’s Democrat Leadership Council (www.DLC.org). The DLC is an outgrowth from Tony Blair's Third Way (now referred to as public-private partnership) political and economic movement. Blair is past chair of the British Fabian Society. The consequence of America’s two major political parties quietly agreeing to public-private partnership economics in coordination with political parties around the world is rapidly leading to the creation of a global to local system of corporate socialism and/or state capitalism - tyranny for sure by any name. The synthesis of: public-private partnership and “social” justice overlain with an ostensible environmental premise are the cornerstones of Sustainable Development. This synthesis achieves the objective of a modern Fabian socialist system of economics, justice and government. Successful implementation of Sustainable Development leads to a global police state. Informed proponents of Sustainable Development expect the police state to be followed by a perpetual condition of utopian-inspired programs to manage a limited but compliant population living in “eco-villages” or Sustainable Communities. An objective of Fabian strategy has been to create a condition where change of governing party creates no change in policy and where a creative destruction of free institutions increases under an acceleration of an arranged condition of Permanent Revolution: confusion, division, dependency – war, revolution and terror. The current strategy for accomplishing a transformation of America is “Sustainable Development” policy. Its tactic is the creation and maintenance of an artificial left/right divide. Democrats and Republicans have become divisions of a globally-subservient one party system. America needs a true second political party to counter this threatening reality if the vision of America, mankind’s greatest achievement, is to be restored and preserved. Michael Shaw is a founder and director of Freedom 21 Santa Cruz and is a frequent host of the nationally syndicated Freedom 21 Santa Cruz Radio Show. He holds degrees in Political Science and Law and has practiced as an attorney and as a Certified Public Accountant. For 20 years he has implemented Abundance Ecology land management techniques on land he owns on the central coast of California. His success at creating an indigenous plant wonderland is unparalleled. Details are available at www.LibertyGarden.com.